As I wrote in Part 1, Los Angeles attracted wine growers in the early 1830s and 1840s and by the mid-1850s, there were over 100 wineries in the Los Angeles area, with at least seventy-five within the town itself (Carosso, 1951). In fact, the 1850 United States Census indicates that there were 57,355 gallons of wine produced in Los Angeles County and in 1851 there were 104 vineyards in Los Angeles County (excluding San Gabriel) with all but 20 within the limits of the city of Los Angeles (McGroatry, 1923). As the area along the Los Angeles River continued to be populated by vineyards and as prime locations on the river began to fill up, settlers looked for other locations. The east side of the Los Angeles River was the first logical place for them to go. The first foreigner to make a major investment there was Irish-born Andrew A. Boyle, who came to America in 1832, and lived in New Orleans, Texas, San Francisco, and finally, Los Angeles. In 1858, Boyle bought some land and a vineyard from Jose Rubio who had planted it in 1835 running right along the east side of the Los Angeles River under the bluffs (Historical Society of Southern California, 1901). He started making wine in 1862, and was the first to grow zinfandel grapes there and started to sell his wine under the Paredon Blanco name. He was also a member of the Los Angeles City Council during the 1860s. In 1851, another Irish immigrant, Matthew Keller, opened a general merchandise store at the corner of Los Angeles and Commercial Streets. He soon joined Vignes and Wolfskill in growing wine grapes after purchasing property on Alameda and Aliso Street, at present-day Union Station. During the time, they were three of the most successful winemakers. Keller added hundreds of acres to his land holdings when he bought 13,300 acres of the Rancho Topanga Malibu Sequit above Santa Monica in 1857, which he named the Rising Sun Vineyard. Like Vignes, he also imported new varieties, and like Vignes, was known as “Don” Mateo (Spanish for Matthew). Present-day Mateo Street is named after him. Today, there’s also a trail named in honor of Keller’s Winery: the Rising Sun Trail in Solstice Canyon in Santa Monica. As the county grew and more and more people settled here, vineyards were started in areas east of El Pueblo, especially in present-day San Gabriel Valley. From the 1850s through the 1880s thousands of acres of grapes were planted there. This included those planted by English immigrant William Workman, and his partner John Rowland, who planted vineyards at their La Puente Ranch in the 1840s and Hugo Reid, a Scotsman, who put in a vineyard in 1839 at his Rancho Santa Anita (today part of the Los Angeles County Arboretum) in present-day San Gabriel Valley and made wine there until he sold the property in 1846. In 1854, German immigrants Kohler and Frohling established one of California’s largest winemaking businesses. They had a large vineyard in Los Angeles with a main cellar in San Francisco. Charles Kohler was a violinist who had eventually settled in San Francisco to found the Germania Concert Society. John Frohling was a flutist in that orchestra. Legend has it that they were inspired to start a winery after eating some Los Angeles grapes at a picnic despite having no knowledge of or skills in winemaking. Aside from their own grapes, they bought those of Keller, Wolfskill, Workman, and Rowland and that’s what allowed them to grow so big and to overtake others in their production. And, they also grew a wide variety of grapes including Riesling, Muscat, Claret, Zinfandel, Burgundy, Sherry, Port and Angelica. The partners are credited with bringing Los Angeles wines into large-scale commerce. It is estimated that they produced 50,000 to 175,000 gallons of wine per year. Like other influential vintners, today, there’s a street named in downtown Los Angeles for them, Kohler Street. They took a prize for best wine in 1858 at the State Fair. And they brought in new varieties to Los Angeles, especially those for making port and sherry. Kohler and Frohling also were the first to make shipments of wine to the east and by 1860, had shipped over $70,000 worth of wine out of California and had offices in New York City and Boston (Pinney, 1989). The Sainsevain Brothers also began shipping their wines to New York City and in 1861, opened a New York City Branch. In 1857, they were the first California vintners to produce champagne-like sparkling wine. Word of Los Angeles wines spread in 1852, when Los Angeles wines were tasted in New York at the American Institute. The Sainsevain Brothers received high marks for their white wines labeled under the Aliso label and also for their sparkling wines. Kohler and Frohling also were responsible for encouraging a group of German and Austrian immigrants from San Francisco to band together and form the Los Angeles Vineyard Society. In February 1857, the society was created with the purpose of buying, cultivating and eventually living on a parcel of land devoted to viticulture along the Los Angeles River. However, that plan did not work out and since the members were so eager to get going, they settled on property along the Santa Ana River instead, some 20 miles away from Los Angeles, and the Society wound up in Anaheim, planting mostly Mission grapes (Pinney, 1989). By the end of the 1860s, more and more pueblo land was being cultivated for wine. 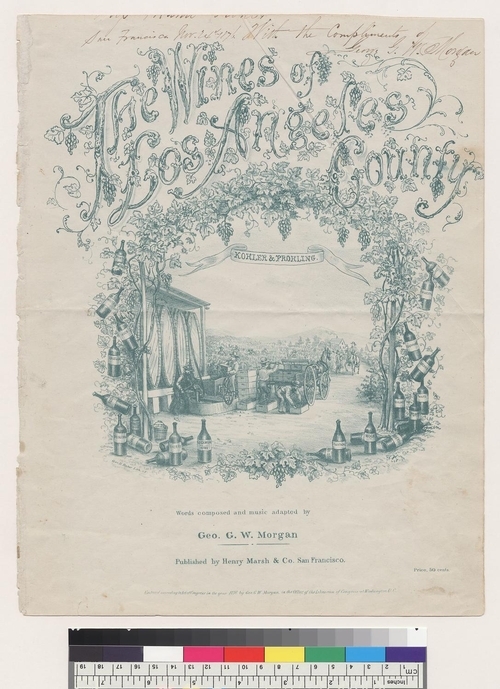 By 1869, Los Angeles had established itself as California's wine center, and its 43 wineries were producing four million gallons of wine annually (Rasmussen, 2000). Carosso, Vincent P. (1951) The California Wine Industry: A Study of the Formative Years. Berkeley, CA: University of California Press. Historical Society of Southern California, (1901) Los Angeles County Pioneers of Southern California, (volumes 5-6). Los Angeles Times, L.A. Then and Now; Wine Industry Took Root on Olvera Street, by Cecilia Rasmussen, (May 28, 2000). McGroarty, John Steven, (1923). History of Los Angeles County, Volume 1. Chicagoe and New York: The American Historical Society. Pinney, Thomas (1989). A History of Wine in America: From the Beginnings to Prohibition. Berkeley: University of California Press. Image from Los Angeles winemakers Kohler and Frohling, circa 1876, shows workers in a vineyard. Image from Bancroft Library, UC Berkeley. Many people might be surprised to find out that California’s first commercial wine country wasn’t in the Napa or Sonoma Valleys, but Los Angeles County. Grapes were first planted in Los Angeles in the late 1780’s, as Spanish missionaries planted cuttings they brought with them from Spain and Portugal. Unlike the vintners of today, the Franciscan fathers made their wines strictly for private consumption. Not surprisingly, the grapes they produced became known as “mission” grapes. Because wine grapes followed the slow expansion of the missions, vineyards planted by individuals were few and far between, and mission vineyards dominated through the early 1830s. As a result, Southern California was the primary winegrowing region of the state with Los Angeles being the largest area in the region. Even as the mission variety of grapes spread to private growers, they didn’t sell or grow them for commercial purposes either. There were exceptions. In Los Angeles, some early Mexican growers including Tiburcio Tapia, Ricardo Vejar, and Tomas Yorba did sell to the locals but not as a large-scale commercial industry. In 1826, Joseph Chapman put in 4,000 vines and became the first American grower on record in Los Angeles. For the next decade, he grew grapes in Los Angeles, eventually moving to Santa Barbara. Then, in the 1830s, as European immigrants moved into Los Angeles, they started to plant other varieties, and planted them with the intention of making money. In 1831, Frenchman Jean Louis Vignes moved to Los Angeles and purchased 104 acres of land and created a commercial vineyard where Union Station is today. He called the ranch El Aliso, named for the large Alder tree on his property. As a result, he became known as Don Luis del Aliso. It was Vignes who made winegrowing a commercial enterprise in Los Angeles, leading directly to it becoming California’s first commercial winegrowing region. Not happy with the grape quality here of the “mission grapes” he brought in Cabernet Franc and Sauvignon Blanc from France. He was soon followed by others and Los Angeles was on its way to becoming the state’s wine growing capital. In 1831, more than 100,000 vines were growing within the current city limits of Los Angeles, or, one-half of those in the state (Carosso 1951). And, in 1833, Los Angeles had six wine growers owning nearly 100 acres of vineyards and approximately 100,000 vines (Carosso 1951). By 1839, Vignes had over 40,000 vines thriving on his acreage and shipped wine at San Pedro, using ships he chartered for regular wine and brandy shipments to the ports of San Francisco, Monterey, and Santa Barbara. In 1849, he had the largest vineyard in California. By end of the 1840s, the Gold Rush led to demand for winemaking, and viticulture became one of the most profitable agriculture industries in California. By the mid-1850s, there were over 100 wineries in the Los Angeles area, with at least seventy-five within the town itself (Carosso 1951). Sullivan, Charles L., (1998). A Companion to California Wine: An Encyclopedia of Wine and Winemaking From the Mission Period to the Present. Berkeley: University of California Press. Workman, Boyle, (1936). Boyle Workman’s The City That Grew. Los Angeles: Southland Publishing Company. The San Gabriel Mission was one of the first centers of wine grape production in early Los Angeles. 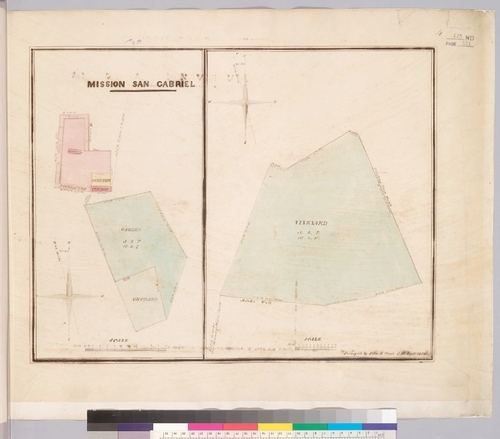 This 1854 survey shows the Mission's extensive vineyard, on the right panel. Image from the Bancroft Library, University of California, Berkeley.